Elmo Hat from Cotton Gin Studios, crocheted with half double crochet stitches, a 3D nose in single crochet, and black on white in single crochet for the eyes. I modified the eyes, since I didn't want to make 3D eyes. I had to create a larger size, since the one in the pattern was small. A favorite, the Despicable Me Minion hat from Ashley's Crochet Place, in double crochet, with earflaps and braids. I had to modify the pattern to have different sizes and to make it look proportionate. 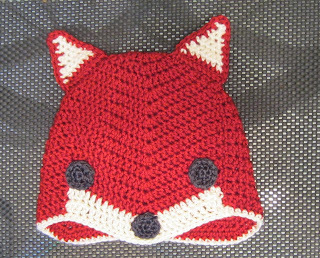 Also, I changed up the way the eyes had to be crocheted. Another favorite with girls, popcorn stitch flower from b.hooked crochet. Hat starts with a double crochet and continues with cross stitches. Color options for above mentioned hat. I love this pattern from Frayed Knot! I had to create the flower pattern, since I couldn't find one I liked online. Chain 2, sc 6 in the second chain from hook. Sl st in ch 2, ch 2, 3 tr in same st as ch, ch 2, sl st in same st, sl st in next st. *Ch 2, 3 tr in same st as ch, ch 2, sl st in same st, sl st in next st. Repeat from * to end. Sl st in ch 4, ch 2, 4 tr in same st as ch, ch 2, sl st in same st, sl st in next st. *Ch 2, 4 tr in same st as ch, ch 2, sl st in same st, sl st in next st. Repeat from * to end. I fell in love with the photo from goodknits.com. The pattern is free, and I had to modify it to be an adult hat, but love the look. Worked in double crochet, and single crochets for the eyes, nose, and ears. So cute!